Mornin’ Glory 100% organic prune products are featured in national and international grocery retail markets. Our prunes are high in antioxidants, fat, cholesterol and gluten-free. They have no preservatives, are high moisture, ready to eat, and great for snacking. The family of Mornin’ Glory products includes: Organic Pitted Prunes and Organic Prune Extract. All prunes are grown and shipped directly from Sowden Farms, Live Oak, California. The rest of our organic prune products are available Wholesale. Please note that while our store is open 24/7, we ship Tuesdays, Wednesdays, and Thursdays only. Ready to eat, packaged in two, 5lb bags. Pitted organic prunes are high in antioxidants, fat, cholesterol and gluten-free, have no preservatives, moist, and great for snacking. Refrigerate after opening. Packaged in 12 ounce (340g) jars, and sold as a 12 pack (1 case). Known as “miracle in a jar”; organic prune extract is healthy and enhances the flavor of a variety of foods from tea, coffee and salad dressings to serving as a marinade to improve the flavor of meat. Refrigerate after opening. Packaged in 12 ounce (340g) jars, and sold as a 3 pack. Known as “miracle in a jar”; organic prune extract is healthy and enhances the flavor of a variety of foods from tea, coffee and salad dressings to serving as a marinade to improve the flavor of meat. Refrigerate after opening. Packaged in 12 ounce (340g) jars, and sold as a 6 pack. Known as “miracle in a jar”; organic prune extract is healthy and enhances the flavor of a variety of foods from tea, coffee and salad dressings to serving as a marinade to improve the flavor of meat. Refrigerate after opening. Ready to eat, packaged in 12 ounce moist pack bags, and sold as a 12 pack (1 case). 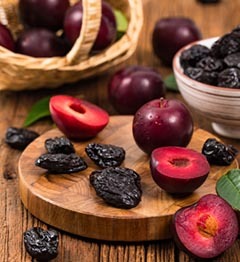 These pitted prunes are re-hydrated to about 35% moisture (this process eliminates the need for preservatives and greatly extends the shelf life of the prunes). Pitted organic prunes are high in antioxidants, fat, cholesterol and gluten-free, have no preservatives, high moisture, and great for snacking. Refrigerate after opening. Ready to eat, packaged in 12 ounce moist pack bags, and sold as a 2 pack. These pitted prunes are re-hydrated to about 35% moisture. (this process eliminates the need for preservatives and greatly extends the shelf life of the prunes). Pitted organic prunes are high in antioxidants, fat, cholesterol and gluten-free, have no preservatives, high moisture, and great for snacking. Refrigerate after opening.